Kob, jewfish, white sea bass, redfish, red drum, black drum, totuava… What do all of these fish have in common? Whatever you call them in your ocean, they are big, delicious, throat-drumming, monster fish. If you can find them, you can usually get a spear in them and then they go nuts, giving you a great fight. 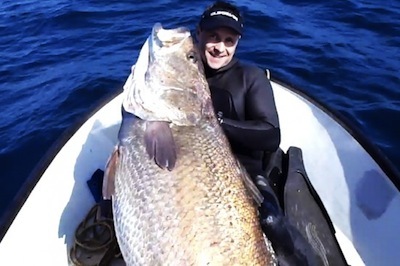 Below is the story from Jaco Blignaut, an active member of www.spearblog.com, who crushed a monster 120-plus-pound kob in South Africa. He’s got some great pics from other dives and some other nice Kob too but this one is an absolute monster. Mexican and American anglers used to enjoy a similar fishery with totuava, a relative of the white sea bass that could grow to 300 pounds. These fish used to swim around in the Sea of Cortez. The morning started out great, a perfect sunrise coming up over the calm ocean. The water looked good and all I wanted to do was launch as quickly as possible and get out into the blue. The plan was to start out in the deeper waters to look for one of my favorite fish, the Daga Salmon / Mullaway. I just love the challenge of spearfishing these fish! Spearing Daga / Mullaway often presents a serious challenge with both shooting and landing the fish. The wrecks and pipelines where the good shoals are found are in water 28 to 40 meters deep (85 to 120 feet), so you really have to dive deep to get a chance on one of these fish. Shooting them is only half the battle won! I’ve been busted up on wrecks with some of these monsters, more often than I would like to remember. After I get all the gear sorted out, launch the boat and I’m on the first spot for the day. I dive down to the bottom and as I get deeper and deeper the vis goes from bad to worse. I land on the bottom and it’s no better than 12 feet visibility — what a bummer! I really thought it was going to be better. I move away from these areas because there are loads of big Zambezi sharks lurking in the dirty water at these spots. For me trying to hunt in that kind of vis in that depth puts myself at risk, so I decide to grab my smaller 1-meter rail gun and head off to shallower spots. It is normally safer in these shallower spots from sharks but there are no big salmon here (or so I thought). I dive for 4 hours and hardly get any decent fish to speak of. I am just about to call it a day when I see a tail sticking out from under a huge rocky overhang. I slowly swim closer to check it out, all the time wondering if this isn’t just another potato bass coming to steal my hard-earned catch. As I get closer, I realise that it’s a nice big daga salmon. I am surprised at how big it looks — it might even beat my personal best for this season! As I sneak closer the fish sees me and it pops out of the cave and starts swimming away. I must get this fish! I must hold my diminishing breath! I start stalking the fish, sneaking closer and closer. I have to get this right! Got to get closer! I’ve lost too many of these really big fish before especially taking into account that I am using the smaller spear gun, I just have to get a brain shot to pull this off. As I sneak closer, the fish notices me, gets excited and swims at least two kicks away from me. I have to get closer than this to get the brain shot right! I manage to get closer and just before the fish decides to blast off again, I get my split second chance — and I pull the trigger. Yes! I plugged the fish right in the brain and it shook only a little. I was so stoked, but I knew this fish could wake up again and shake out the spear that was probably only 10 cm in the head and swim off. I grabbed the fish and started swimming up to the surface. On the way up to the surface I could see it was a good kill shot. I got to the surface with my fish and it seemed to me to be in the 40’s weight-wise — so another really really nice daga for me. But, I wasn’t overjoyed because I thought the fish was bigger. It just looked that much bigger down there. While trying to hoist the fish over the side and into the boat I found it more difficult than usual. I had some flu a week before and had also recently come back from a commercial dive trip, so I thought that maybe I was just a little tired and unfit. Once I got the daga into the boat we decided to take a quick video clip and some pictures, but in the process I really battled to lift the fish. I seriously started to wonder what was wrong with me. I started to think that maybe this fish was heavier than I previously had thought. But it does not look bigger. I thought this because the fish was so fat it made it look short. We headed for the beach and as I got off the boat some commercial fishermen, who had been fishing for many years and whose opinions I’ve always respected, came to look at the fish. Once home, I weighed the fish on my spring scale and the needle jumped past the 50-kg mark. Now I knew for certain that I had something that might be a South African record — a record that has stood for more than 10 years. Because spring scales are not very accurate, I figured I’d rather get it onto an electronic scale that had been calibrated correctly. I got back into the vehicle and rushed off to Durban to get an official weight. Man, what a long day! I finally got there and plunked the fish onto the scale — 57.4 kg (127 pounds)! 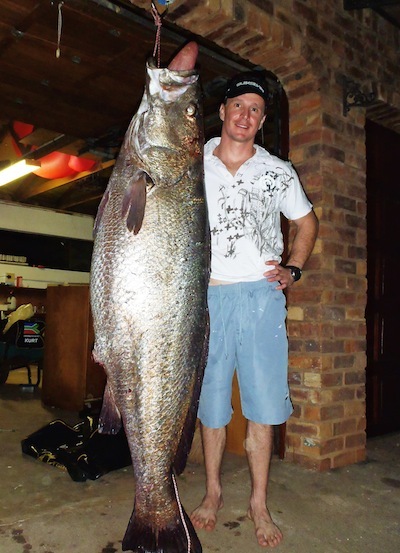 The fish is a pending South Africa record as well as a pending world record! Just goes to show that you never know what’s going to happen out in the ocean! Every now and again the magic happens and gives you the stuff that keeps you talking around the dock for years to come. There are way bigger salmon out there, many South Africans have seen and lost some, myself included. So maybe next time you go for a dive, even at your own local spot you might come across that big one! Cameron Kirkconnell is one of the best know spearfishermen on the planet. He holds the world record for Dogtooth Tuna and has logged thousands of other notable catches. Cameron travels the globe to remote locations to spearfish for some of the most exciting fish in the world. He is currently sponsored by RIFFE and operates the website www.spearblog.com. He has some phenomenal captures to his name and embraces the true essence of adventure. Extreme is not a word used lightly with spearfishers but there is little doubt that Cameron is extreme.